In the LoTR movies (not sure if the books are the same) but when Gollum lost the ring to Bilbo decades ago in The Hobbit, he appeared to look the same and even move the same in The Fellowship of the Ring. Bilbo on the other hand, seemed to have aged very rapidly when he passed the ring to Frodo. When Frodo met up with Bilbo in Rivendell shortly after his quest began, Bilbo appeared much older and even more much slower. I realize that Gollum had the ring for much longer than Bilbo, but wouldn't him losing the ring have the same effect as it had on Bilbo? If I understand your question, you're asking not about the change from Smeagol to Gollum, but the change from "Ian Holm" Bilbo to "Ian Holm in old-person makeup" Bilbo after he gave up the ring, while Gollum didn't rapidly age after losing it. It's possible that the Ring's preservative powers build up over time, or affect you on a deeper level the more you use it. Gollum used it a lot for centuries, Bilbo used it a little for decades. This especially makes sense because the Ring's other effects, such as its addictive nature, are definitely shown to increase with repeated use. If this is the case, Gollum was simply still "warm" from the Ring, while Bilbo "cooled off" faster. If given enough time, Gollum may have experienced rapid aging as well. Unlike Gollum, Bilbo gave up the Ring (mostly) of his own free will. This may have contributed to a greater "detaching" from the Ring's influence, while Gollum, who was still obsessed and seeking the Ring with every thought and action, may have stayed more under its influence. Put another way: greater control by the Ring could mean greater effect by the Ring. If there's anywhere in Middle Earth that will help wash away the influence of Evil, it's Rivendell. Similar to the first possibility, it's possible that whatever "residual charge" from the Ring is preventing Gollum from aging would normally have the same effect on Bilbo, but the ambient magic of Rivendell helped wash it away, returning Bilbo to his non-Ring state. Normally the Elves try to slow down time, but in this particular instance, their power may have sped it back up to where it was supposed to be. There's really no way to know which, or which combination, of these possibilities is actually in play. (And yes, out-of-universe you wouldn't be wrong to say it's just a casting/filmmaking issue). But all three are based on extrapolations from things we see in the canon, so they're probably as close as we'll come to an "official" answer. Bilbo aged rapidly when the One Ring was destroyed, not when he gave it to Frodo. 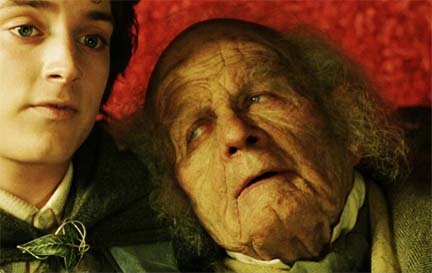 When the One Ring was destroyed, Bilbo aged rapidly to the appearance he would've had, if he had never found the ring. If Gollum hadn't been roasted, when the Ring went into the fire, he would have rapidly aged 500 years, in other words, a dead hobbit.